The Gate is first out of the traps in the curious case of the duelling Sean O’Casey productions to mark the 1916 centenary, as his 1924 classic is here directed by Crestfall playwright Mark O’Rowe. Declan Conlon and Marty Rea are a formidable pairing as O’Casey’s inimitable self-deluding male comedy double-act. Conlon is the self-proclaimed nautical veteran ‘Captain’ Boyle, a work-shy layabout who once crewed a boat to Liverpool and now infuriates his long-suffering wife Juno (Derbhle Crotty) by continually carousing with ne’er-do-well neighbour Joxer (Rea) and pleading medically mysterious pains in his legs whenever the prospect of a job appears. Juno’s uphill battle to maintain the family’s dignity takes place in a starkly decaying gray tenement room, with a staircase visible whenever the front door is left open. O’Rowe exploits this bleak space with increasingly dim lighting as the Boyle family is torn asunder by its own complexes of self-delusion, social climbing, and self-destructiveness; a matrix which O’Casey uses to skewer middle-class mores, the Catholic Church, Civil War Republicans, and the Trade Union movement. It’s startling that in just 14 years Conlon has reached the age where people would think of him not for Hotspur but for Henry IV or Falstaff. He provides a Paycock long on voluble self-pity and contempt, but short on self-awareness and compassion. Conlon is terrific at waspish contempt, but his performance suffers by O’Rowe’s directorial choices. O’Rowe, possibly reacting to Howard Davies’ 2011 Abbey production of Juno, reins in the slapstick. Davies conjured business to emphasise O’Casey’s vaudeville clowning, but Ciaran Hinds’ self-deluding bombast made his later self-righteous fury truly scary. O’Rowe’s stricter fidelity to the text narrows Conlon’s range. And so Rea’s performance stays in the memory longer. He plays Joxer with an impish quality (as if he had flitted in from a Shakespearean fantasy to laugh at mortals), shrinking into as little space as possible, legs always coiled around each other, darting in and out of windows and across the stage startlingly quickly, and extending his final refrain of ‘A Daaaarlin book’ into an almost serpentine hiss. Paul Wills’ austere set design tracks O’Rowe’s approach, a drab room with sparse and meagre furnishings in comparison to Bob Crowley’s sprawling 2011 Abbey set, whose vivid crumbling was akin to Tyler’s brownstone in Fight Club. In this setting Crotty’s turn as Juno is characterised by exhaustion above exasperation, not the Fassbendering turn one might have anticipated; instead Ingrid Craigie’s Maisie Madigan steals scenes. 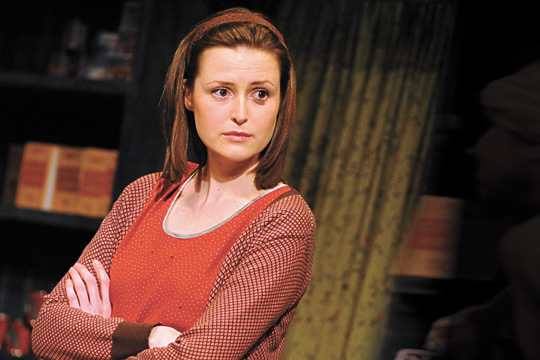 Juno’s valedictory ‘It’ll what have what’s far better, it’ll have two mothers’ is hollowed by Crotty’s hapless resignation towards crippled Republican son Johnny (Fionn Walton) and synchronicity with Union daughter Mary (Caoimhe O’Malley). O’Malley elevates Mary from cipher, layering cruelty towards her ex-boyfriend (Peter Coonan) with an initial startled adherence to and a later dogged rebellion against sexual morality that seems self-destructive compulsion. Given Juno’s self-pitying matrimonial rebukes that are both loudly performed and ineffectual O’Rowe hints at matrilineal failings that bode ill for Mary’s child. The 2011 Abbey co-production with Southbank’s National Theatre remains the recent gold standard, but O’Rowe’s more subdued take features sufficient fresh unexpected insights to render it an interesting companion piece to Davies’ exuberant interpretation. Juno and the Paycock continues its run at the Gate Theatre until the 16th of April. Director Patrick Mason expertly mines a classic comedy for laughs for the third summer in a row, with the help of regular collaborators including Marty Rea. Designer Michael Pavelka furnishes a fabulously opulent 1920s country house set for Noel Coward’s comedy of deplorable manners, complete with absurdist touches like the classical bust above the door that bafflingly manages to hold a cigarette in its lips. Rea, a Mason regular after Arcadia and The Rivals, plays the spoilt toff Simon Bliss who invites femme fatale Myra to his country house for the weekend only to discover that his sister, father and mother have all invited a guest for the weekend too, and not told each other, never mind their put upon servant Clara. And that’s about as much plot as Coward bothers with, everything else is the interactions of the guests and their hosts. Highlights of these comically brusque encounters include a peeved Rea entreating his guest to have a seat by launching her in the direction of the sofa. Ingrid Craigie Fassbenders as the retired actress matriarch Judith for whom all the world’s a stage, but who is continually wounded by references to her advanced years in connection to her inviting a star-struck gentleman caller. Beth Cooke essays a Cowardian rather than a Stoppardian teenager for a change as Sorel, the most self-aware of the Bliss family, who tries to rein in their bad manners but unconsciously seems to realise that such atrocious behaviour is just too much fun. 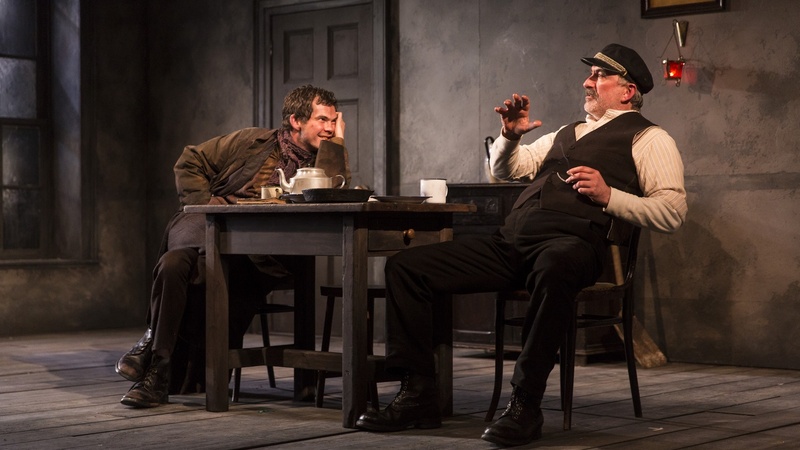 Stephen Brennan is nicely scatterbrained as the novelist patriarch whose furious indignation, when his just finished book’s geographical accuracy is questioned, powers the final and funniest scene of the whole play. Coward’s play becomes progressively funnier as it proceeds, beginning with the guests arriving and being ignored by their hosts, before partner-swapping all round leads to romantic play-acting which terrifies the guests. Stephen Swift, a blustering buffoon in Arcadia, here milks laughs as a simpering ninny (invited by Judith) whose over-enthusiastic delivery of the word ‘Rather’ repeatedly brought the house down. I’ve twice ripped screenwriter Mark O’Halloran for his devotion to misery so let me praise to the heights his turn as the diplomatist invited by Sorel. O’Halloran’s is by far the most stylised performance. His pencil ronnie, nervous smile, and exaggerated sitting movement and motions are almost commedia dell’arte, and his performance is comedic artistry. While Kathy Rose O’Brien’s flapper makes occasional hilarious outbursts against her treatment it is only Myra, the most acerbic guest, vampishly played by Jade Yourell, who forlornly rebukes the Bliss family. Behaving badly is so much fun that the Bliss family engage in deliriously enjoyable bickering oblivious to their guests nervously fleeing this madhouse. Coward’s drawing-room comedy may not quite reach the heights of Wilde but such a feast of absurdist action and witty lines is to be relished. Druid fostered Martin McDonagh so it’s pleasing to see Garry Hynes belatedly directing his satirical play originally written for London’s National Theatre. In 1934 the younger inhabitants of Inishmaan have their heads turned by the prospect of escape to America if they can only get a part in the filming of Man of Aran on Inis Mor and impress the director Robert Flaherty. Billy Claven, the titular cripple, is the most eager, desperate to escape a life of tedium living with his half-mad pretend aunts, where the only respite from shuffling to the doctor for his various ailments is staring at cows. McDonagh’s dialogue is as wonderful as always, with his trademark repetition and love of outrageously cruel black comedy everywhere. Babbybobby (Liam Carney) urges Billy to feck books at cows to liven them up a bit, while Helen and Bartley have a lengthy discussion in front of Billy of the conflicting accounts of whether his parents killed themselves by drowning rather than endure living with his deformities. The characters’ comedic obsessions, whether it is Kate talking to a stone, Eileen eating yalla-mallas when stressed, Bartley discussing telescopes, or Helen pelting eggs at people, give all these actors ample opportunity to deliver tremendous comedic turns, with the double-act of Crowley and Nancy E Carroll as Mammy O’Dougal Fassbendering for all their worth as Johnnypateenmike tries to aid his mother in her ongoing quest since 1871 to drink herself to death while she fervently hopes to see him in his grave first. But in McDonagh’s subversive finale the characters that seem most honourable turn out to be vicious and the most obviously vicious characters end up displaying some oddly tender hearts. As fellow academic Graham Price pointed out to me the ending, while tender towards the long-suffering Billy, is ultimately a negative version of Synge and Wilde’s belief in the power of a lie to transform the lives of their heroes. McDonagh thus delivers his own verdict on whether lying really can transform a feckin’ eejit into a likely lad. 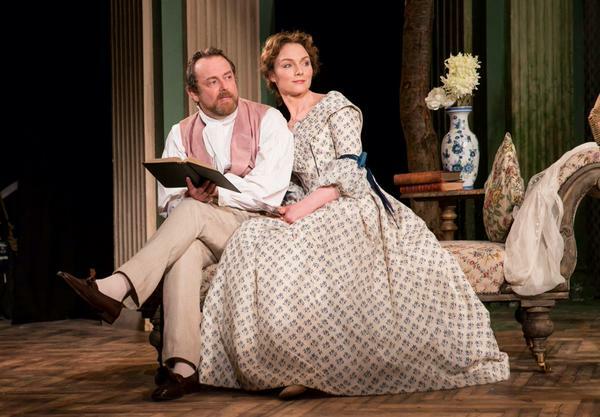 Arcadia, Tom Stoppard’s 1993 masterpiece, received a towering treatment by the Gate theatre a couple of months ago. Director Patrick Mason, as well as re-uniting with two of his stars from last summer’s Abbey production of The Rivals, Marty Rea and Aoibheann O’Hara, found roles for Gate regular Barry McGovern and the go-to girl for Stoppardian teenagers (after last year’s The Real Thing) Beth Cooke in his elegant production. At nearly three hours long the play unfurls a romantic comedy in two acts (set in two different centuries) that is really about chaos theory, bad academic scholarship, and the conflict between imagination and rationality. Stoppardian theatre is always just such a theatre of ideas, and duller critics dislike it for that reason because he makes them feel rightly stupid, but Stoppard has an unrivalled capacity to integrate abstract concepts into highly personal conflicts and to present complex ideas accurately but as high comedy. Stoppard’s celebrated wit is given full rein in numerous sparkling lines such as Lady Coverly’s put down of her brother; “As her tutor it is your duty to keep her in ignorance”, “Do not indulge in paradox Edward, it puts you in danger of fortuitous wit”; and Septimus’ “I will not kill one of the few poets England has produced for the sake of a woman whose honour could not be adequately defended by a platoon of musketry deployed by rota”. Septimus’ ingenious praise eventually leads Chater to emotionally convince himself that in fact his wife loved him so much that she slept with Septimus for the sake of a good review by Septimus in the ‘Piccadily Review’. She didn’t . Joe Vanek’s unfussy set was dominated by a large table on which characters from both eras deposited props so that past and present blurred as the play proceeded towards a surprisingly emotional ending as a careless line by Hannah revealed the tragic fate of characters joyously alive in the earlier period as both times collapsed into the same physical space. The ensemble was impeccable but special mention must go to Andrew Whipp as Bernard Nightingale who, especially in his repeated rejoinder of “I don’t know, I wasn’t bloody there” to all requests for more detail on his conclusions and his exit line of “Oh just publish!” on being told by Hannah that she knows something but can’t prove it, mined pure comedic gold.